Cate: Infinite Sadness… or Hope? My name is Cate. I am a forty-something woman living in Christchurch, New Zealand. … I started blogging because I felt I had something to say. I had already published a book called Infinite Sadness in 2009. It was an autobiographical account of nearly twenty years of living with chronic mental illness. I was severely depressed and had anorexia nervosa. I repeatedly tried to kill myself and harm myself. The routine of my life revolved around hospital admissions and at the time I published the book I suspected that this was going to be my life. I’ve changed my mind. I’ve decided that there is something more than infinite sadness and so I wanted to share my journey with you. Recently I have been diagnosed as having Borderline Personality Disorder, rather than depression. This is a hard disorder to get a handle on. It’s not talked about very much and there has been a tendency in the mental health world to disregard sufferers because they are just too hard to handle. Isn’t that just great? To add to the mix the last couple of years have seen a dramatic decline in my physical health. In 2010 I was diagnosed with the auto-immune condition Graves’ Disease. This is currently under control but I am still receiving treatment for it, and it will be an issue for me for the rest of my life. It was caused by medication I took for my mental illness. Also I have just been diagnosed with Fibromyalgia, a cruel condition often brought on by auto-immune diseases and severe trauma. It consists of pain and more pain. And fatigue. It’s not nice and as I am new to this I am still learning about the condition. Again, it appears it will be with me for life. So I write about all of these things, as I fight for a return of mental health and a means of managing my physical issues. Want to know more? Start reading. I hope you enjoy my writing. … I believe in silliness. Yes, really. What I mean is that in spite of everything we need to be able to resort to the silly things in life. Sometimes laughing is the best thing we can do and I have always appreciated those people I know I can be silly with. You should try it sometimes. It’s not about denying or ignoring the pain. Just taking a break now and then. Her blog used to be titled Infinite Sadness or what?, which is the title of her Facebook site. She was without hope and at first she borrowed hope, then when that borrowed hope was lost, her own began to grow. She renamed her blog to Infinite Sadness… or hope? The stories she shares, the causes she advocates for, and the gifts she gives every day offer hope and inspiration for the rest of us. Please visit her blog and Facebook pages, you won’t regret it. I promise. Tracy Shave, the powerhouse behind Giggle Together and author of the blog, Traciness – In all it’s glory, recently contacted me on my Facebook page and informed me she had accepted my challenge and created this wonderful badge. I think it is beautiful, cute, and creative. It perfectly embodies the beauty that rises from the ashes of destruction and the strength that comes from moving through painful and challenging things in our lives. I am Tracy Shave. “Traciness” is a term that has been used in different organisations as they hand work for me to do. It is a technical term commonly used to express a need for something to be brighter, more creative and “in your face”. It is also the term used when describing my diagnosis. I may have been diagnosed by a doctor with Bi-polar Disorder II and there are indications that I have undiagnosed Adult ADHD but for me they all add up to having “Traciness”. I have a son who has ADHD, AUTISM and Sensory Processing Disorder – or “jamieness” as I like to call it – his name is Jamie. We are, after all, just individuals! This is that world and I’d like to share it with you. This is a woman who has done what needed to be done to move from the lowest of lows and figure out how to not just survive, but also to use her experiences and realities to thrive and grow Ina me from. Please visit her blog and meet her for yourself. Keith: Acceptance – What is Courage? As defined at Dictionary.com Courage is the quality of mind or spirit that enables a person to face difficulty, danger, pain, etc., without fear; bravery. The reason I ask “What is courage?” is because I was recently awarded the Courageous Confessionals Blog Award by Kina of Human in Recovery and also Athena Brady. This award is probably the one that has meant the most to me so far because it comes from an idea that Kina had after going through some personal struggles in her own life and she found reading the blogs of others helped her to get past these struggles. 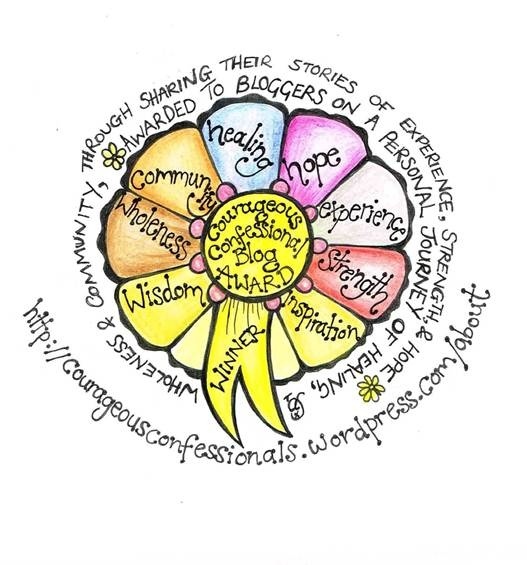 She decided to set up the Courageous Confessional Blog Award to celebrate those bloggers who tell their story in an open, honest and often exposed manner in order to heal themselves, aid their personal growth and wellness. I was lucky enough to be nominated by these two fantastic ladies and brilliant bloggers who have inspired me and given me so much support on my journey with this blog. The first “acceptance & pay it forward” post. Please read it and visit the other courageous folk named. Due to unforeseen circumstances I do not have internet access at home for the foreseeable future. I will use public access as I am able, as using the phone to post is challenging & difficult for me. So, it is up to you, dear readers, to copy the badge and write a post awarding the blog & blogger you think deserves the award & notify them. Please leave a comment with the link to your post either here or on the Nominations page. I will get back to posting as soon as I am able.